Before placing a bet on horse racing, there are a number of factors you should consider when making your selection. The distance of the race, the ground on which the contest is taking place, the course form and the jockey on board are all variables that can improve or decrease a horse’s chance of being successful. A factor that a lot of people fail to consider, though, is how well the trainer is performing at the time. This is particularly important ahead of major meetings such as the Cheltenham Festival in National Hunt racing and Royal Ascot on the flat. If a trainer is struggling with their form, there is generally an explanation for it. An illness, for example, may have broken out in the yard, which is likely to affect the whole stable. All newspapers, racecards and online horse racing websites reveal a hot and cold list for jockeys and trainers over the last 14 days. This is something which you should pay particularly close attention to before betting on horse racing. If the trainer of a horse you are looking to back is on this cold list, it is not to say you should not bet on the selection at all; you simply have to factor it into your equation before making your final decision. It is very difficult for a trainer to go through a 12-month period in the sport without having ups and downs. There will be points on the calendar where whatever they send out to run, tends to win. This is the point where you should follow this trainer, regardless of the price or the race. Their mounts will often produce a career-best, therefore they can outrun their odds, even if they are one of the outsiders; while if they have one of the favourites in the race, you know it is likely to justify being at the top of the market. Willie Mullins walks from the gallops during a visit to Closutton, Carlow, Ireland. We have seen trainers get off to a flying start before the Cheltenham Festival and then continue that hot streak across the course of the four days. 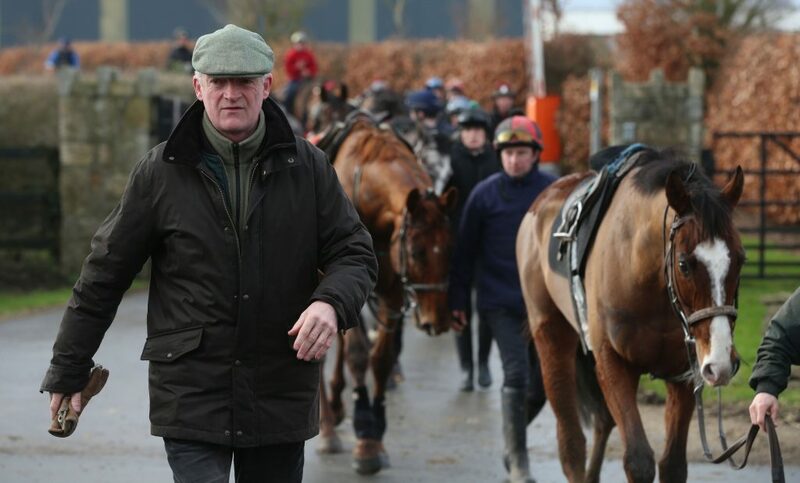 The most notable person to do that is Champion Irish Trainer Willie Mullins. In 2015, the Irishman had four winners on the opening day of the Festival, with success coming in the Supreme Novices’ Hurdle, Arkle Chase, Champion Hurdle and Mares’ Hurdle. He went onto break the record for the most victories at the meeting with eight wins. Those who spotted his success early would have made a solid profit from the week by backing his leading selections. Some trainers also have good records at certain courses. With this in mind, it is worth looking at to see who the leading trainer is at the racecourse you are looking to place a bet at. This is particularly important for two-year-old horses who are in their debut seasons on the track. If a trainer trusts a course, he is likely to continue to send his best colts and fillies there. Due to two-year-olds not having much form to their name, this is where you may be able to pull off a big price winner in the betting. As ever with horse racing betting, the more time you put into your form study, the better chance you have of finding a successful strategy.